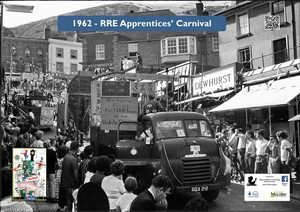 Malvern Carnival week was run by the Apprentices from the RRE College of Electronics between 1955 and 1967. The events were hugely popular attracting many thousands of people and in turn raising thousands of pounds which went to local health related good causes. Much frivolity was had, beer was drunk, dances were held, Rag Mags were sold and perhaps inevitably the authorities were, on occasions, unimpressed. None of this detracted from having a thoroughly good time! An early hint that the apprentices had any acting flair came in April 1948 when they staged a variety show “It’s on the cards” at Geraldine Hostel. There was a cast of 15 plus Fred Carline (who provided the music). It was very popular – they had to repeat it a week later. Was this the beginning of the Rag Shows? 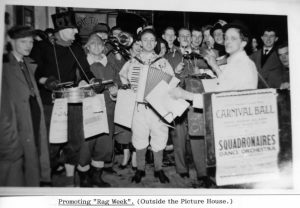 The first “Rag Week” including its carnival procession came in 1955. The Rag Mag was imaginatively titled “Taurus Abundum” or some suspect Latin related to bulls. It contained some equally suspect humour was a bargain at 1/- (thats 2 ½ P today). The procession and the Saturday night dance in the Winter Gardens were the highlights of the week. In later years a “Rag Show” took place in the festival theatre with much of the material written by the apprentices themselves. 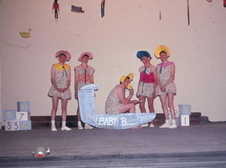 The Nelson Players also performed as did local group “The Trackers”. The carnival procession followed a similar route every year starting in Spring Lane working it way up through Malvern Link, Link Top and Belle Vue Terrace. Then going down Church Street and ending in Geraldine Road. Prizes were awarded for various categories of ‘Floats’ – these generally involved a barrel of beer. A toilet was cemented to the pavement outside Woolworths hidden inside a tent. Sadly no pictures survive. Various mountaineering attempts were made on Church Street – did they make the summit? 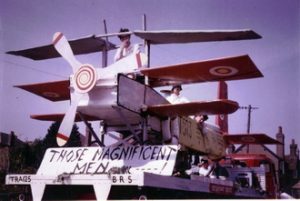 The Malvern carnival procession continued into the 1980s with many youth groups taking part (including myself several times). It has recently been resurrected.